Published on December 19, 1897 to commemorate the paper’s move into its new headquarters, the “New Era Edition” of the San Francisco Call was distributed across the state and the nation. By 1897, the San Francisco Call had been a longstanding institution in San Francisco since 1856. The front-page of this massive 80pg issue displayed a full illustration of the new structure christened the ‘Claus Spreckels Building.’ The image depicts an imposing steel and stone structure which stands in stark contrast to the pedestrian human landscape in its shadow, a clear vision of urban grandeur. Throughout the paper’s headlines the Call reports a “New Era” has come for not only the newspaper but for the city itself. The migration of the paper into the one of the largest and imposing structures in the city declared their own confidence and evaluation of San Francisco’s significance in the West. The earliest mode of travel to the Golden Gate was that known as coasting, for in no other way could California then be reached. San Francisco’s first settlers came hither by water, and although the pony express and overland stage which followed later were succeeded by railroad facilities for passenger and freight transportation, the coast trade of California has always been of vast importance to the people and the State, and will continue to occupy a position of steadily increasing value in the world of commerce as time goes on. 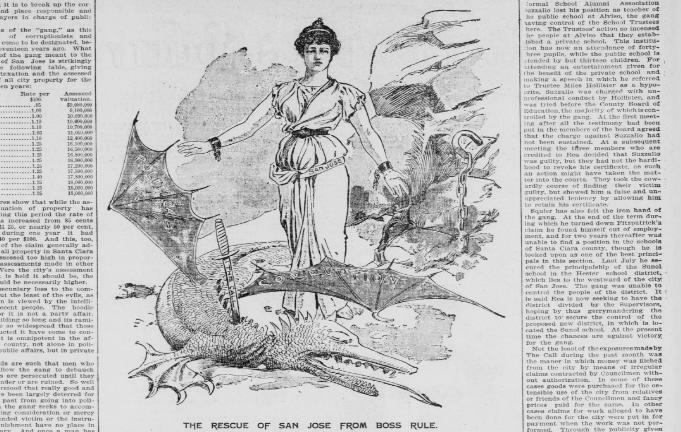 The San Francisco Call cartoon depicting the defeat of civic corruption in San Jose, California in the winter of 1897. What is most interesting about this New Era Edition are the overall suggestions it makes about regional identity in the West, in California, and in the Bay Area particularly. Article after article lauds the success and development of the state – from agriculture, horticulture, mining, oil production, and many other industries and manufactures. The wheat of the valley, the wine of the hills, and the gold in the mountains, the Call implies, would not be exploitable without the existence and cooperation of the city’s municipal power and its influential commercial-civic elite. Even Sacramento and Stockton, large urban centers in their own right are described as being dependent on the city by the Golden Gate for their own success. Los Angeles would be similarly dismissed as subordinate to San Francisco’s power. As the New Era Edition seemed to demonstrate, the entire Pacific Basin seemed to be appropriated as under the jurisdiction of San Francisco. In this series we will look at various aspects of the New Era Edition and its interpretations of a regional identity. How does a paper reveal clues to a regions collective identity? What does it mean when even their competitors, the Chronicle and Examiner, more or less agree with the depiction of the city as the Pacific Metropolis? Is it prudent to translate corporate media’s consensus into collective identity? Would it be a stretch to argue that the residents or even tourists of the city thought in similar ways? As the Call reports, and as numerous political and public speeches suggest, the city was perceived to have emerged out of the tumultuous 1880s with a new sense of dominance and superiority in the region. A dominance that had deep roots in San Francisco’s history. What does this impression of the city say about the community and collective identity? December, 1897. “Coast Trade,” The San Francisco Call, San Francisco, California. You are currently reading The San Francisco Call: “New Era Edition,” Part I at Gilded Empire.